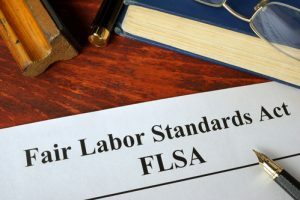 Under the regulations mandated through the Fair Labor Standards Act (FLSA), most American workers are entitled to a minimum wage and overtime wages for any hours worked beyond the standard 40 in a single calendar week. By violating these or various other wage or labor laws, employers may commit wage and hour violations that can lead to significant penalties. Failure to correctly pay overtime: Perhaps the most common wage and hour violation, there are far too many workers in America who work more than 40 hours per week, but either are not paid overtime at their correct rate or do not receive overtime pay at all. Under the FLSA, the clear majority of employees are entitled to time-and-a-half pay when working more than 40 hours in a week. That pay should factor in any bonuses and commissions earned in that week, as well. Not paying for work done off the clock: A significant percentage of employees do not get paid for work performed outside of their standard shift times. If employers allow employees to perform duties while off the clock and expect to benefit from that work, federal law dictates they count those hours toward wages and overtime, regardless of when those hours happen during the day. Illegally deducting money from a paycheck: Employers cannot make deductions from paychecks, with a few exceptions. Some deductions are federally mandated, such as any deductions for child support or wage garnishment purposes. Other deductions are consented to by employees, including money put toward healthcare premiums, retirement benefits, Medicare and income tax withholding. Not paying minimum wage: This is the single most basic employee right there is in the United States, and yet it is still one of the most frequent wage and hour violations. New York’s minimum wage is somewhat higher than the federal standard, but employers in all states are expected to adhere to their local laws. Paying tipped employees less than minimum wage: There are different rules in each state regarding how tipped employees are paid, including the minimum wages for those employees. Some employers pay tipped employees even less than this amount if they expect the employee to make a significant amount in tips, which is illegal. Stealing tips: Another common violation specifically related to tips is tip stealing. Employers are not allowed to request or accept any tips earned by employees. In New York, there is also no requirement for tip pooling. For further information and guidance on these common violations and what to do if you believe your rights have been violated, meet with an experienced New York wage and overtime lawyer at Cilenti & Cooper, PLLC right away.